The other night my friend Leigh (displaced Texan and a total sweetheart) texted to see what I was up to. She had just flown back to DC from visiting her sister and nephews in Alabama, and she wanted to hang out. I told her I wasn’t doing anything but reading a cookbook. When she arrived at my house, she wanted to know all about this cookbook. She’d never ‘read’ one as a book herself. I handed over Alexe van Beuren and Dixie Grimes' The B.T.C. Old-Fashioned Grocery Cookbook: Recipes and Stories from a Southern Revival, and Leigh just about crowed with delight. She gasped over the Tex-Mex Pimento Cheese, and she laughed over the recipe introductions, just as I had. I promised to lend it to her as soon as I was finished with it myself. I’m glad we’re friends, and now I’m glad we’ve bonded over Southern cooking, too. In a small town twenty-five minutes outside of beautiful Oxford, Mississippi, there’s been a revival of food and community. Bucolic small-town Water Valley wasn’t the most logical place to start a grocery and cafe, but that’s just what Alexe van Beuren did, in a historic building that her husband had saved from demolition. The B.T.C. Old-Fashioned Grocery opened in 2010 amidst a cloud of hope and dreams, full of glass-bottled milk, local produce, and Cora’s fried pies. Trouble loomed when hope and dreams proved insufficient for the daily realities of running a small business when lo and behold, Dixie Grimes, a five-star chef, walked through the door in need of a job. Within a few months, Dixie’s food had folks lining up at the window, and the two women discovered that after all, this small town in rural Mississippi was exactly where they needed to be. The B.T.C. quickly cemented its place as the center of town life, serving hearty breakfasts and comforting lunchtime meals, as well as selling prepared foods like casseroles, salads, and spreads to take home. 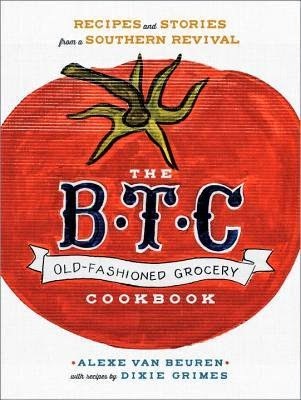 With vibrant storytelling, 120 recipes, and 60 evocative full-color photographs, The B.T.C. Old-Fashioned Grocery Cookbook shares the inspiring story of how dreams can pay off in a small-town tale of food, friendship, and tradition. Alexe van Beuren is one of a group of women who are making over the town of Water Valley, Mississippi. Alexe started a gourmet grocery store there in 2010, and in 2011 celebrated chef Dixie Grimes joined the B.T.C. family, whipping up breakfast, lunch and deli fare for the local crowd. Though the first years were tough, and Alexe admits that it’s much harder work than she ever imagined, the grocery has brought her community new life. The story is chronicled in this cookbook, and it’s obvious it’s not just wishful thinking – the grocery and the people running it have become part of the heart of the town. This cookbook is full of Southern basics (from spreads to the broccoli salad I recognize from potlucks), and that’s kind of great since I did NOT grow up with them. Now I know how to make Southern staples I’ve heard of (and even some I haven’t). Soups seem to be the B.T.C.’s ‘specialty,’ though recipes cover all types of food served in a deli (breakfast, spreads, sides, salads, casseroles and mains get top billing). Overall, it’s simple, unfussy fare presented with a story and a history. Aside from the food itself, the introductions prior to each recipe add personality and a sense of what the B.T.C. Old-Fashioned Grocery (and the town of Water Valley) is really like. I found this cookbook to be an entertaining, useful, and well-written story of food, family, and community rejuvenation. And what food! Dixie Grimes’ recipes have appeared in famous magazines and newspapers. It’s evident why: they all sound amazing. Personally, I can’t wait to try the Roasted Pear and Zucchini Soup (page 48), Green Apple Casserole (page 137), and Peach Ice Box Pie (page 210). In an 8-quart stockpot, bring 1 cup of water to boil. Set a steaming basket on top and add the asparagus. Steam the asparagus until it is bright green and al dente, 4 to 6 minutes. Immediately transfer it to a bowl of ice water and let cool. Remove the asparagus from the bowl and pat dry with paper towels. 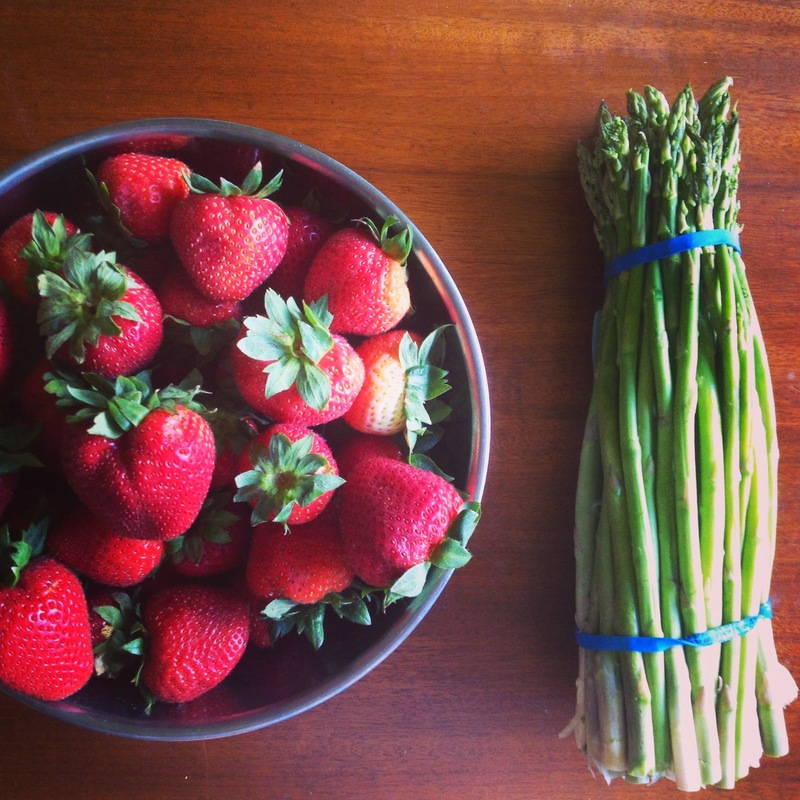 Put the asparagus in a bowl and add the strawberries. 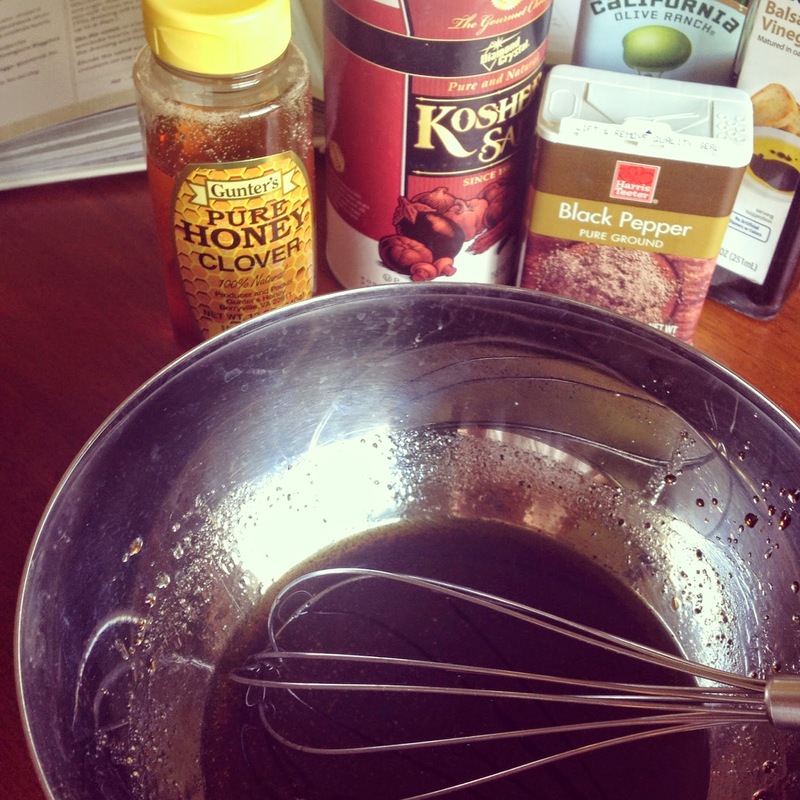 In a separate bowl, whisk together the oil, vinegar, honey, salt and pepper. 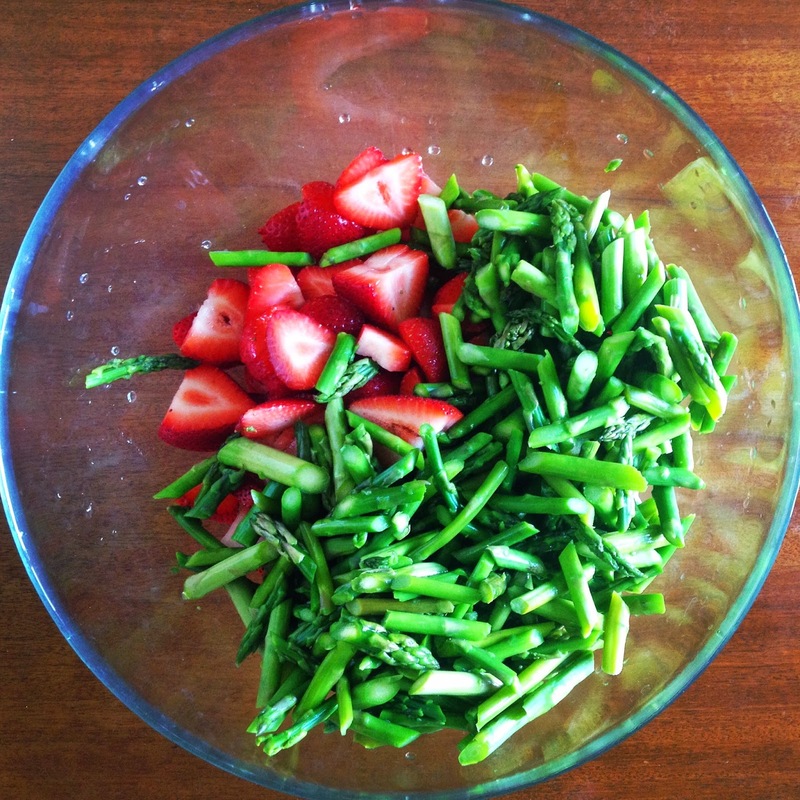 Pour the dressing over the asparagus strawberry mixture. Transfer to the refrigerator and chill 1 hour before serving. Yields 4-6 servings. Note: This salad is at its best (and brightest) if you eat it the day you make it. Also, I’m not going to lie, I watched a YouTube video on how to cut asparagus on the bias. Yep, that basic. p.s. The salad? Turned out beautiful & DELICIOUS. Spot on flavor and easy-as-pie. Making it again soon. All in all, this cookbook is mouth-watering, funny, sweet, quirky as only small-town life can be, and a treat for both the belly and the soul. If you don’t believe me yet, by all means check out a selection of pages here (including the recipes for Pimento Cheese and Chicken, Asparagus, and Mushroom Casserole, along with that scrumptious-looking Peach Ice Box Pie). Recommended for: anyone interested in small-town revivals, Southern cooking and incorporating fresh local produce into scrumptious recipes (healthiness not guaranteed). Fine print: I received this book for free from Blogging for Books for this review. 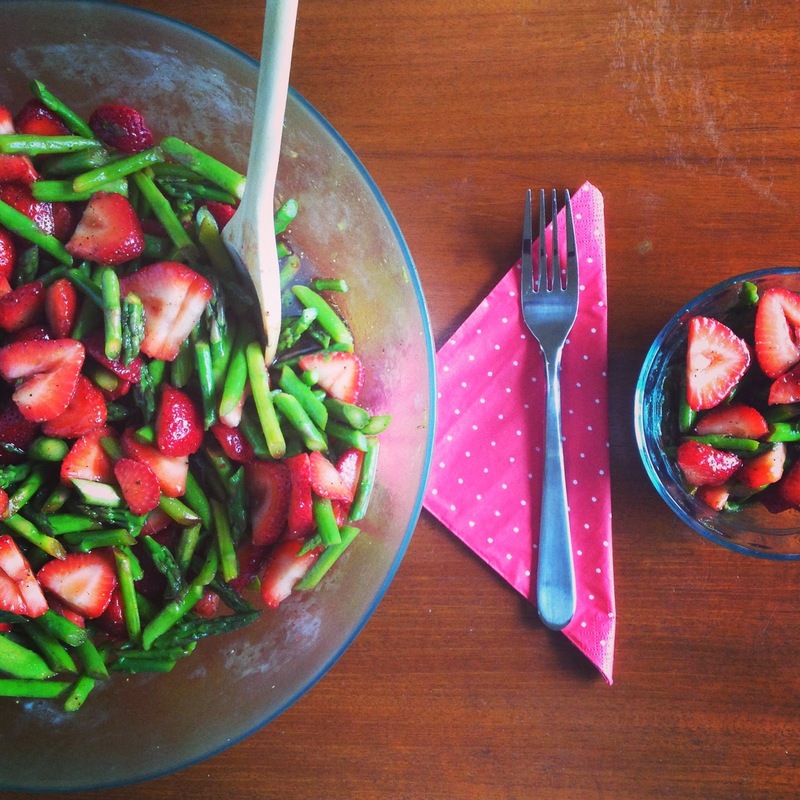 Asparagus and strawberry is an unusual combination, but I'll bet it's delicious. This cookbook sounds like a lot of fun! That salad looks wonderful. I've never been a fan of asparagus until recently. Grilling it is my favorite way to eat it but I'll have to give this salad a try. Of course you are right: no cookbook can be properly reviewed until a recipe is attempted! I never would have thought of putting asparagus and strawberries together, but spinach and strawberries is a thing, so why not? Ooh, I love asparagus ... but with strawberries? Who'da thunk it? What a great cookbook for reading -- the story behind it sounds like a novel. Roasted Pear and Zucchini Soup sounds amazing! Your strawberry salad is beautiful. This sounds like a great read, the back story is so interesting and I much prefer unfussy recipes. sounds like a good choice, but the store and the book. Thanks. Sounds like a tasty read. This combo is very unique and I will have to give it a try. This cookbook sounds delightful and I may have to add it to my wish list. Thanks for highlighting it. The book sounds fun, and that salad lucks yummy. Yum yum yum! Everything about this sounds amazing. Sounds so healthy and lovely. I love vinegar.